I visited a lady recently who was trying to sell a very pretty cottage on the edge of a village in Yorkshire. It was one of half a dozen similar properties, and as I parked my car, I noticed one of the neighbouring cottages was also on the market. Over a cup of tea, I asked the lady about this other cottage, and was surprised that she didn’t know its asking price, how long it had been on the market, or whether it was actually getting any interest. How could she make sure she was competing well with her cottage? Don’t wait until they sell before putting yours on the market – often, property competition is positive, generating more interest and viewings for each homeowner. How many times have you seen a street with lots of sold signs on it? Interest begets interest, and it can actually create a buzz around the area with viewers booking to see more than one property. Do your homework – you need to find out all you can about the other property, so that you know how well it compares with yours. Does it have a bigger kitchen, but a smaller garden? Has it been decorated more recently than yours? Is it shabby chic to your minimalism style? Look carefully through all the photographs you can find on the agent’s own website and on Rightmove and Zoopla, and try to look at them through a buyer’s eyes. How does your house compare? The best way to find out about your neighbour’s house is to…. Talk to them – if you don’t already know your neighbour, (and hopefully you haven’t fallen out!) then go and talk to them about your properties. If you can both see it as a joint marketing opportunity, you have a much better chance of both getting what you want: a sale. Be as honest and open with your neighbour as you can, and discuss your reason for moving (you better hope you aren’t theirs), timescales, even the price they need. You are much stronger as a united front. If you open up with them, there’s every chance they will do likewise. You could even agree between you not to drop your asking price without first speaking to the other. Use the same estate agent – if your buyers are likely to be similar, using the same agent means that more often than not, they will book viewings on both houses. A buyer viewing both will not only have a true comparison of both properties, but could well be an invaluable source of feedback for you. If both houses are on the market at the same asking price, a buyer preferring your neighbour’s may be able to highlight any areas your property is lacking, giving you the chance to put these right. 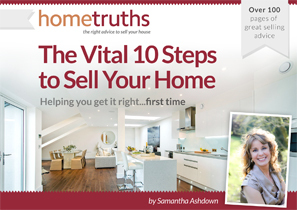 Having the same estate agent can help to make the whole viewings process more transparent. Don’t play a negative bidding war – I once had a client who had dropped their asking price nine times over the course of just a few months, because his neighbour was playing the same game. Do this, and neither of you wins. You’re not Poundland. Get your neighbour onside and both agree to stick to your asking price, and don’t drop it without an open and frank discussion withyour neighbour. If they sell before you do – don’t take it personally; it could have been the smallest of things that persuaded the buyers their property was the one for them. And don’t worry, you may find another neighbour has been waiting until they do before they put their home on the market! As you can see, selling when you have competition can be a real opportunity to sell your house more effectively. And remember, estate agents’ offices are often clustered together with several on one street. Take a leaf out of their books!